Speaking to the House of Commons in 1601 in support of An Act Conc’ninge matters of Assurances, amongste Merchantes, Francis Bacon outlined the fundamental importance of marine insurance to trade, and thus to the nation. With his usual eloquence, he explained to MPs how insurance means that with the ‘loss or perishing of any ship, there fol- loweth not the undoing of any man, but the loss lighter rather easily upon many, than heavily upon fewe’. Bacon did not expand on the nature of the many who were to grant merchants, in exchange for ‘some consideration of money… assurance made of their goods, merchandises, ships and things adventured’. He expressed no opinion as to whether insurance would best be provided by individuals (as it was almost exclusively when he spoke), or groups of individuals associated into companies (as it was to become).1 Adam Smith was more certain. In Wealth of Nations he asserted that marine insurance is one of the very few commercial activities for which joint-stock companies constitute an appropriate form of organisation.2 In the many decades between Bacon’s silence and Smith’s pronouncement, the question of private versus corporate underwriting was addressed repeatedly. 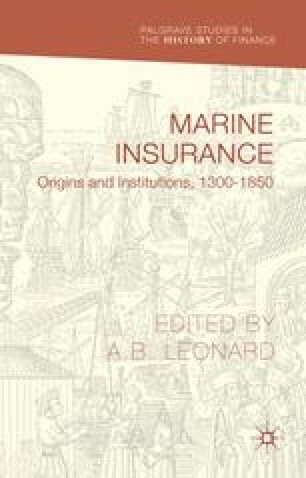 This chapter examines the development of corporate forms of marine insurance underwriting in Britain over the centuries, culminating in the first chartering of British joint-stock marine insurance companies in June 1720.